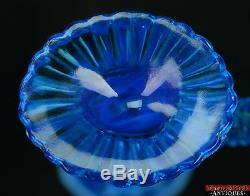 Fenton Blue Opalescent Glass Hobnail #389 Crimped Hand Cornacopia Crystal Vase. It does not have any chips, cracks, or flea bite marks on them. For your consideration is this vintage hand vase by Fenton in the pattern of hobnail. This is a gorgeous blue opalescent hobnail (#389) cornacopia vase being held by a hand. It measures about 6" tall x 4" at the widest part. It does not have any chips, cracks, or flea bite marks on it. Please see the pictures for more details. By purchasing items with Tamarack Shack Antiques, 10% of all sales are donated to BEAM, the Belize Education & Action Ministry, a non-profit Christian organization. BEAM provides scholarships to Kings College as well as supports the monetary and spiritual needs of churches within northern Belize. Kings College in Belize is a Christian high school boarding school that prepares its students for success in life by teaching academic courses as well as various trades and job skills. Thank you for supporting these students as they further their education. Other examples of the use of funds are building supplies for Kings College and affiliated churches. BEAM doesnt spend funds on travel for USA volunteers to and from Belize, assuring that BEAM funds go directly to the Belizean people. If you have interest in becoming a volunteer, making more monetary contributions, or simply to network, contact Gene at 715.339.2819. The item "Fenton Blue Opalescent Glass Hobnail #389 Crimped Hand Cornacopia Crystal Vase" is in sale since Friday, September 18, 2015. This item is in the category "Pottery & Glass\Glass\Art Glass\North American\Fenton". 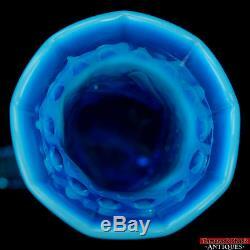 The seller is "meredith411" and is located in Phillips, Wisconsin. This item can be shipped to United States.